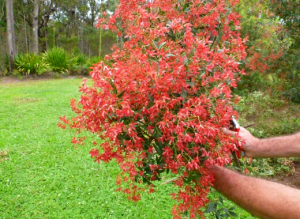 The Christmas Bush, a native Australian plant used for decorating during Christmas time. What do you think of when you hear the word “Christmas”? Snow? Santa? Pine trees and sweaters and reindeer? That may be a good image of Christmas in Japan or America, but in Australia, Christmas day is usually 30 degrees celcius or hotter! It’s too hot to even THINK about sweaters! Seasons in the Southern Hemisphere are opposite to those in the Northern Hemisphere. As a result, Christmas falls in the middle of Summer in Australia. Not to worry, though – of course we still celebrate it. We just do it in different ways. Like many western Northern Hemisphere countries, Christmas is still a very special time to gather with friends and family, share a meal, and give presents. We still enjoy lighting decorations and putting up a Christmas tree in our homes. We still exchange presents among family members. Because of Australia’s European heritage, we still have the same Christmas songs, and a few of the same dishes at Christmas dinner. We eat turkey and potatoes, and have Christmas fruit cake for dessert. But since it is so hot, we also have lighter options for Christmas dinner. Seafood is a popular choice. 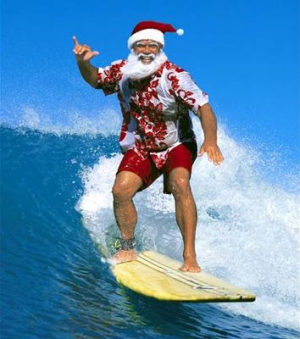 Christmas is at the beginning of summer vacation for school children, so some families go camping or have a barbecue on the beach. Also, the story that we tell our children is that Santa’s reindeer have a rest when he arrives in Australia, and he switches his sleigh to kangaroos (He also changes into some Summer clothes!). Don’t worry, though. 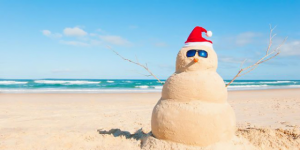 Living in Australia doesn’t mean missing out on cozy, winter-themed celebrations of Christmas. 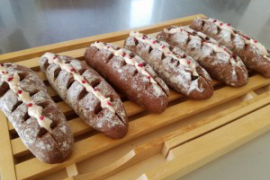 Sometimes Australians have “Christmas in July.” July is the coldest month of the year, so we gather with friends to have hot, mulled-wine, roasted ham, fresh bread rolls, and hot pie for dessert. While “Christmas in July” is not a national holiday like December 25, I am excited to live in a country where there are 2 chances for Christmas every year!